Jeff Lewis Tile is a line of natural stones offered in Honed Italian White Carrara Marble, Polished Black Marble, Limestone and Basalt Stone. Each palette of colors is offered in unique mosaic tile patterns that pair with three matching field tile sizes, a baseboard and liner. Created by famed interior designer Jeff Lewis, the coordinated tiles allow users to easily create timeless beautiful spaces in their own homes. 1 square foot, 2 pieces per pack. Pack weight is 6 lbs. Buy online Jeff Lewis 6 in. x 12 in. 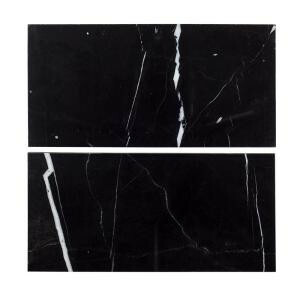 Nero Marquina Polished Marble Field Wall Tile (2-pieces / pack) 98457, leave review and share Your friends.